The identified works of nine historical artists and two contemporary artists are featured. 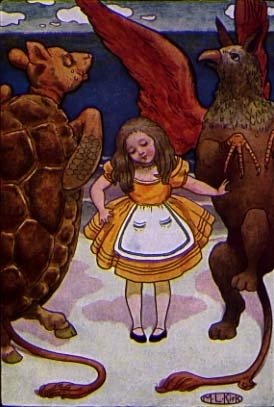 The Mock Turtle sighed deeply, and drew the back of one flapper across his eyes. He looked at Alice, and tried to speak, but for a minute or two sobs choked his voice. 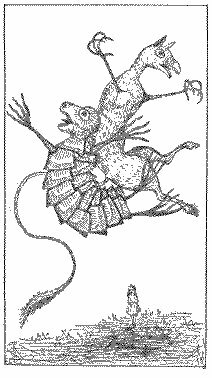 `Same as if he had a bone in his throat,' said the Gryphon: and it set to work shaking him and punching him in the back. `"What matters it how far we go?" his scaly friend replied. `Yes,' said Alice, `I've often seen them at dinn--' she checked herself hastily. `You're wrong about the crumbs,' said the Mock Turtle: `crumbs would all wash off in the sea. But they HAVE their tails in their mouths; and the reason is--' here the Mock Turtle yawned and shut his eyes.--`Tell her about the reason and all that,' he said to the Gryphon. `IT DOES THE BOOTS AND SHOES.' the Gryphon replied very solemnly. Alice was thoroughly puzzled. `Does the boots and shoes!' she repeated in a wondering tone. `And what are they made of?' Alice asked in a tone of great curiosity. `Wouldn't it really?' said Alice in a tone of great surprise. `Don't you mean "purpose"?' said Alice. `Explain all that,' said the Mock Turtle. 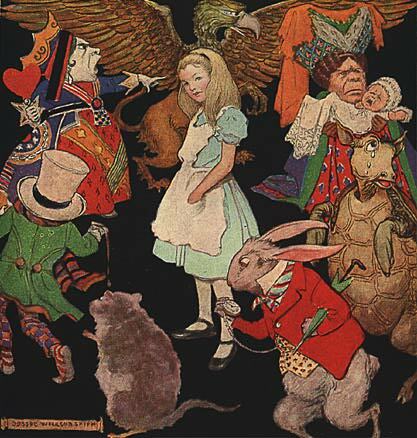 So Alice began telling them her adventures from the time when she first saw the White Rabbit. She was a little nervous about it just at first, the two creatures got so close to her, one on each side, and opened their eyes and mouths so VERY wide, but she gained courage as she went on. `It's all about as curious as it can be,' said the Gryphon. `It all came different!' the Mock Turtle repeated thoughtfully. `I should like to hear her try and repeat something now. Tell her to begin.' 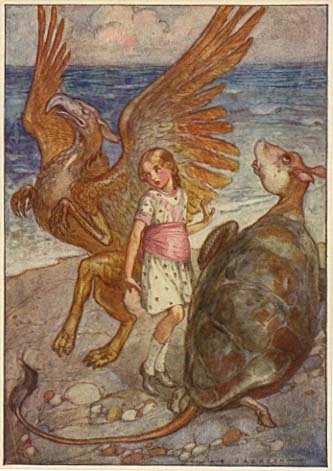 He looked at the Gryphon as if he thought it had some kind of authority over Alice. `Stand up and repeat "'TIS THE VOICE OF THE SLUGGARD,"' said the Gryphon. `That's different from what I used to say when I was a child,' said the Gryphon. 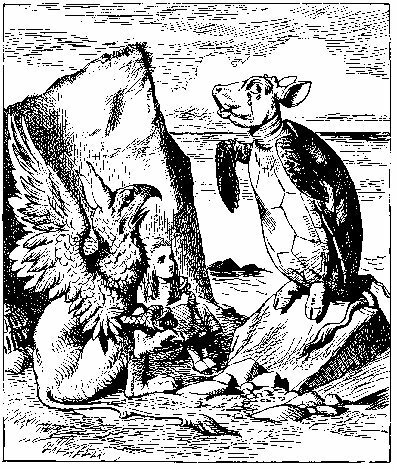 `I should like to have it explained,' said the Mock Turtle. `It's the first position in dancing.' Alice said; but was dreadfully puzzled by the whole thing, and longed to change the subject. 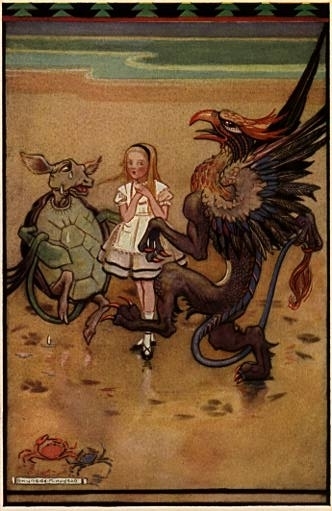 `Yes, I think you'd better leave off,' said the Gryphon: and Alice was only too glad to do so. two pennyworth only of beautiful Soup? READ THE NEXT CHAPTER OF ALICE IN WONDERLAND?